The Goblin Valley State Park is located 48 miles southwest of Green River off of Highway 24 in Utah in a remote area. Though a little out of the way and rather expensive for a state park with a $20 entry fee, it is worth visiting for families. Through natural forces such as wind and water, deposits from an inland sea over 170 million years ago, were formed into goblin shaped rocks. Cowboys in search of their cattle first discovered the secluded Goblin Valley in the 1920. In 1964, Utah designated the area a state park. 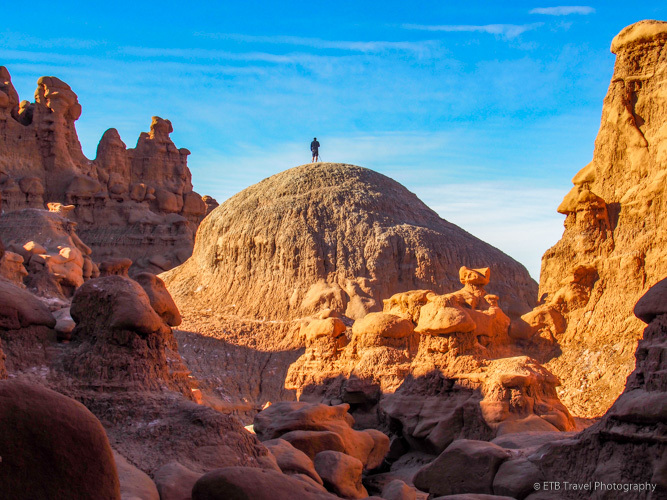 The Goblin Valley State Park includes campgrounds and hiking trails. Its north side is a good staging area for OHV riding. For day visitors, the three valleys of “goblins” is the major attraction. With that, I drove to Observation Point and randomly walked through the valleys of sandstone features. For a short time, I was one of only a few people in the valleys. The area is so vast, I couldn’t even see them. I looked through windows, climbed over rocks, weaved through features, and summitted a grey mound in the middle of all the goblins for a great view. Suddenly, an onslaught of young boys came crashing into the valley. At first, I felt frustrated my solitude in nature was disturbed. Then I realized what a fun park this is for kids. I likely would have loved it when I was ten years old. I watched them explore caves, find geocaches, and climb pretty high up some of the pinnacles. While I’m certain the park is suffering erosion, the freedom of climbing these goblins had to be so fun for the kids. I can see how Goblin Valley State Park would be much more attractive to families than the surrounding national parks with severe climbing restrictions like Arches, Bryce, Canyonlands, and Capitol Reef. And I suppose the $20 entry fee is much lower than a National Park entry fee too.